Employers of all sizes are experiencing the rapid digital transformation of the HR department powered by advances in technology while the competition to attract and retain increasingly young digital natives has become fierce. As a result, there has been a surge in tech startups re-imagining the HR industry. By 2020, more than half of the global workforce will consist of 80s and 90s babies — with millennials taking the helm at senior managerial and CEO positions and driving the strategic directions of the world’s leading companies. At the same time, a variety of tech-powered solutions have emerged; with the likes of job boards and marketplaces, application submission and processing tools, and day to day HR operation management software playing an integral part in HR departments around the world. Unsurprisingly, investments in HR tech has significantly increased over the last few years. According to data tracking venture capital investments in this space, the first quarter of 2018 saw nearly $800 million being injected into HR tech startups. More importantly, the same research indicates the amount to be equivalent to the total raised in 2017. But beyond the more common HR solutions in the market today, to remain competitive, attract investments and become leaders in their own right, the new generation of startups are creating sub-verticals within the world of HR through niche solutions. They focus on various elements ranging from employee acquisitions to engagement and communication — with below representing a round-up of some interesting HR concepts. 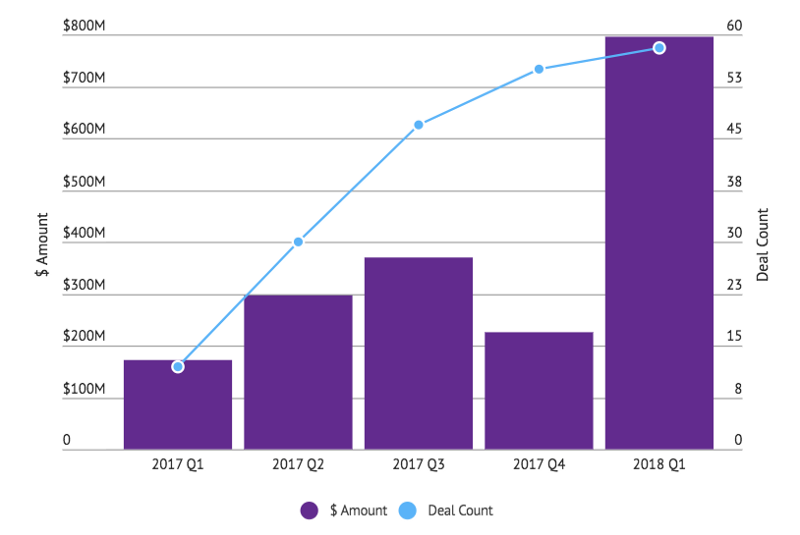 According to data tracking venture capital investments in this space, the first quarter of 2018 saw nearly $800 million being injected into HR tech startups. With the face of the workforce changing, so have employee expectations. The new employee is no longer just driven by financial incentives. Instead, they are more likely to value things like ownership of work, collaboration, and flexibility more than their predecessors. To tackle this, startups developing data-driven business intelligence solutions focused on solving HR challenges such as retention, engagement, and performance have taken centre stage. For example, as highlighted in Deloitte’s review of Global Human Capital trends, companies including Deloitte are looking at data from travel, billable hours and other performance related KPIs to help employees improve their levels of energy, wellness, and business performance. The lines between professional and personal have blurred in the fast-moving age of social media. Companies are expected to be social and available in real-time on various social media channels in order to engage with their customers. Similarly, employees at large enterprises and young startups, are encouraged to be equally as social online and establish themselves as thought leaders in their own disciplines. And this is where companies like Smarp — a recent portfolio company of Nauta — are making moves. The company has developed a content hub for large enterprises which enables a streamlined and efficient content and knowledge sharing platform across a company’s employee network for increased employee brand advocacy. Additionally, Smarp is solving the issue of disengaged and disconnected employees — estimated to cost each large company more than $60 million every year. Often recommendations from their immediate network have been the go-to resource for finding those candidates for companies. Lately, this HR strategy has experienced a degree of digitisation with the birth of SaaS platforms designed to amplify and maximise the impact of employee referrals. In certain cases, these new age referral platforms can perform many different tasks — from talent pipeline management, social media integration to marketing and reward schemes. One such example is Talentry — a SaaS start-up disrupting traditional HR referrals with a marketing-based approach to winning new talent by leveraging their employees social networks. For companies leveraging these platforms, this results in a massive social boost across multiple channels but also leads to better qualified and relevant applicants. Companies and employees are always looking for ways to automate repetitive tasks, and arguable HR operations can be the most repetitive and admin intensive element of this industry. Yes, there has already been a degree of automation in HR operations for a while — whether it’s in the form of templated contracts or automated payroll systems. But what new tech startups have introduced in this space is the availability of tailored solutions that not only automate HR operations but also double as enterprise resource planning software. A prime example of this is Holded. Founded in 2016, the Barcelona-based startup is an all-in-one management software for medium and small businesses which allows business owners to manage most of their core business activities such as accounting, payroll, recruitment and pipeline management, and CRM from one platform. And lastly, it’s clear that modern HR departments have gone through a period of transformation. But while technology powers the tools, HR still remains to be about humans. Indeed, the new wave of HR startups have not only developed solutions modernising human resources — improving both recruitment and job search— but they have found ways to enable a more interconnected ecosystem that’s human-centric.